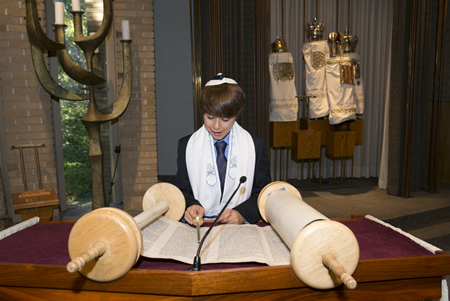 In Reform Judaism, both boys and girls formally assume responsibility for a “life of mitzvot (commandments)” at the age of thirteen during the Shabbat service at which they become B’nai Mitzvah. This important day is an occasion to mark the acceptance of responsibility. It also recognizes the wonderful accomplishments of our young people. To mark the moment of religious passage, our B’nai Mitzvah fulfill mitzvot which they have never been able to perform: They are “called up” to read from the Torah and are asked to conduct the worship service – privileges that, according to our tradition, are given to Jewish adults. For many American Jews, Bar/ Bat Mitzvah is an event. Our goal as a congregation is to help it become more of a process, part of an ongoing sense of becoming more Jewish, not only for the child but also for the family. More than this, we want to help recapture the long-lost sense of coherence between the Bar/Bat Mitzvah and other moments of our Jewish lives. Inner meaning, spirituality and such age-old Jewish values as study, justice, giving, sanctity, and moderation can become more real as a part of Bar/Bat Mitzvah. We hope your child will focus not only on reading the Torah, but also on hearing the Torah as uniquely addressed to us in our time and in our place. We hope you will join us in keeping in mind the true meaning of this important day in the lives of our young people. This day is about family. It is about Jewish commitment. It is also a demonstration of Jewish knowledge. Most importantly, it is a way for our children to feel part of a Jewish community that will nurture them all of their lives. We hope that the process of becoming Bar/Bat Mitzvah will involve the entire family and will demonstrate to our children that being a Jew is about worship, study and involvement in tikkun olam, repairing the world. Temple Israel is known for preparing our young people in a thoughtful, complete and heartfelt manner for their Bar/Bat Mitzvah. This includes addressing a child’s individual educational and emotional needs and working with families to ensure that this rite of passage is as meaningful as it can possibly be. To that end, we encourage you to call us if we can be of any help. For more information and details, please call us at (203) 227-1293 and speak with Lisa Goldberg, Executive Director; Karin Beitel, Director of Education or Cantor Dan Sklar.